The two St. Tudwal’s Islands lie about 2 miles S.E. of Abersoch, protecting the anchorage known as St. Tudwal’s Road. The E. island, which has a spring near the middle of its E. side,lies about a mile from the nearest point on the mainland; midway lies the W. island, of similar area, but without natural water supply and no sign of early settlement. The E. island is formed of shales and grits;l with erratics, these have provided all the building materials, but the roofs of the early structures must have been of thatch or turf. It is of about 26 acres rising to about 150 ft. on the N.,and is now entirely grass-covered. The ground slopes down gradually from the loo-ft. high cliff” on the W., affording some shelter from the prevailing winds. The main area of settlement is on the eastern slopes, a little above the spring, at a point where the slope permits building without excessive excavation or levelling. Three early terraced fields lie below; the upper fields enclosed by turf banks and the substantial bank which crosses the island are probably all of the 18th century. A path down to the landing place which was improved by Fr.Henry Balie Hughes in the 19th century; the recesses for timber are his work. St. Tudwal probably lived in the 6th century, 2 but no evidence for an ecclesiastical settlement of this date has been found here. The earliest documentary references occur in the 13th century,3 but the name of a neighbouring parish, Tudweiliog (Tudwal’s land), implies that he or his cult was well-established in the area long before that time. The island is shown and named on the 14th-century Bodleian (Gough) map of Britain, but this may be due to the importance of the anchorage. The priory is first mentioned in 1291, and in 1410 it is stated to be of the Augustinian Canons.” It is last mentioned in 1509-11;5 before 1540 the church was described by Leyland as desolate. 6 There are occasional references to the use of the island during the 18th century,7 but the last serious attempt at occupation was that of Fr. Hughes, who in 1886-7 tried unsuccessfully to establish a monastery there;8 traces of two round turf huts remain, one dated to about this period by excavation; and he repaired and reconstructed, for use as a chapel, the building erected in the 18th century across the W. end of the original church. This was again repaired in the 1930′S when it was fitted with a concrete floor, which has prevented a complete examination of the church. This ‘Chapel’ and the earlier structure to the W. which was cleared out in 1930 were the only buildings visible before the excavation of 1959-61. 9 Apart from a few flints and pot-boilers which were not associated with any building, the earliest structure on the site was indicated by a system of post-holes N. of the church, and a rock-cut slot apparently to house a vertical stone slab. These did not make a clear plan, but it seems that the remains continued beneath the modern “chapel” and medieval church. This occupation level produced some Roman pottery, and a few other Roman finds were made elsewhere on the site. The earliest stone building was the church (Plate 43) oriented 30° N. of E. It measured 26 ft. by 15 ft. internally with walls 3 ft. thick, dry-built of rubble but pointed with lime mortar on the inner face, on footings of rounded boulders projecting internally; it had a central W. doorway, of which only a few courses remained, and a second narrow one at the E. end of the N. wall. There was a block of masonry forming an altar against the E. wall. The walls survived to a maximum height of 3 ft.;no evidence of fenestration remained, and no dateable objects were found. The reference to a church in the 13th century suggests that this building existed by then, and its character indicates that it is not as early as the 12th century, but more precise dating is not possible. Beneath the floor level, four burials were encountered projecting from beneath the “chapel”. Their stratigraphical relation to the church could not be determined, but unlike it they were correctly oriented, with feet to the E. This must simply that the area had sacred associations, and was used for burials, before the erection of any of the buildings known to exist. 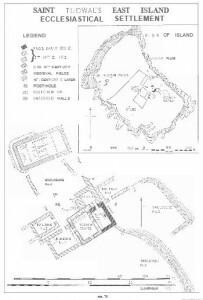 Several regular buildings were added to the church; none contained positive dating evidence, but their probable sequence is indicated by the numbering on the plan. The floor of No.2 showed two levels of occupation, the later being associated with a shortening and partial rebuilding. No. 4, the latest addition, was the sacristy, and against the W. side of this was a mass of masonry possibly the foundations of a stair to an upper chamber. An enclosure extended north-wards from this complex, but its walls had been extensively robbed and eroded. About 50 ft. N.of the church, and apparently later than the enclosure wall, were the remains of a building 36 ft. long by 17 ft. (Plate 44); although its orientation (200 N. of E.) is more nearly correct than that of the church, it is not parallel to the burials. The upper (W.) end had rounded external corners and was embraced by a deep rock-cut drainage ditch; the floor had also been carefully levelled into the rock, so that the lower part of the wall was formed of free-standing solid rock. The building had been completely robbed from a point E. of the door, but the position of the end wall was determined by excavation. West of the central hearth, four post-holes (marked by the ranging rods in Plate 44) indicated the position of a framed structure, perhaps a loom. There were stone benches against each surviving wall, that at the W. end being wider and set a little off-centre as if to avoid the hearth’s being obscured by the ‘loom’. An interesting feature was the carefully made rock-cut housing for the base of a cruck truss. This consisted of a small platform 3 ins. high containing a mortice to house a tenon in the foot of the principal, which was given further stability by a vertical hollow in the rock wall. The position of this, and of vestigial remains of a similar housing 7 ft. 6 ins. to the E. (indicated by the points of the pegs lying horizontally, Plate 44), indicate that there must have been four cruck trusses. The finds, and the character of this building, date it to the 14th century. 1 CT Nicholas, Quarterly Journal of Geological Soc. of London, Vol. LXXI (1915), pp. 83-143. 2 Baring-Gould and Fisher, pp. 271-4. A. Butler and D. Attwater, Lives of the Saittts, Vol. IV, p. 455. N. K. Chadwick, Studies in the Early British Church(195 8 ), pp. 59,82 n. 3, 319. 3 The first certain reference is to the Priory of “Enys Tudwal” in 1291, Taxa/io, p.291 (=Rec. Caern., p. 227), but “Tutdey” (Valuation of Norwich, pp. 190-1, ca.1254) probably refers to the island. 4 See re£ 3 above; also Arch. Camb.,1922, pp. 91-2. 5 H. E. Salter, Chapters of the Augustinian Canons (Oxford,1920), pp129, 187. 8 A ketch of the Life Fr. Hughes,]. H.M.,Catholic Truth Society, Cardiff, 1890. 9 Interim report, Trans. Caerns. Hist. Soc., XXI (1960), pp. 6-1 3. Final report forthcoming.